Fox4 anchor Baron James, who co-anchors the station's 5 and 10 p.m. newscasts with Clarice Tinsley, is being let go after roughly a decade in the D-FW market. "Baron James' contract has not been renewed," a station spokesperson confirmed Wednesday morning. His last day at Fox4 will be on Jan. 17th, the spokesperson said. James has not returned a phone message and an email left Tuesday. Last summer, he was off the air for more than two months after surgery to remove a growth from his larynx. He returned on Sept. 16th. Known for his flashy on-air wardrobes, James previously worked in Pittsburgh at ABC station WTAE-TV and before that with NBC affiliate WSFA-TV in Montgomery, Alabama. 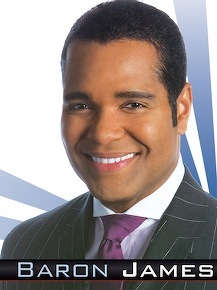 His Fox4 bio notes that he and Tinsley were named "best anchor team" by the Associated Press in 2003. James also has been part of the station's coverage of the Sept. 11, 2001 terrorist attacks and the Space Shuttle Columbia disaster. Tinsley likely will solo anchor at 5 and 10 p.m. after James departs.